No matter whether you are a beginner or an expert, there are classes to suit your physical, mental and spiritual needs. There are even classes for parents and children, classes for the older enthusiast and classes for those who like to create a sweat! No-one need miss out on this opportunity for personal development. Check out a couple of changes to the timetable. There has been slight changes to previous times so please check the times of your regular class. This timetable was updated Jan 9th 2019. Please note we are no longer running Zumba classes on Sunday at 4.30pm. We hope this doesn’t cause too much inconvenience and hope you can find a suitable class throughout the week. Hatha Yoga – Most ancient system of yoga for mental, physical and spiritual wellbeing. Total stretching of the body and relaxation of the mind. Suitable for all abilities. Yoga Power Hour – Based on Astanga yoga this dynamic form of yoga will help you detox and de-stress. Develops flexibility, strength and helps weight-loss. And enjoy a complete relaxation to finish…….. Suitable for all abilities. Pilates – Improve your body alignment, flexibility and strengthen your inner core. Develop a healthier body with the flow of postures and movement. Suitable for all abilities. Pilates Body Ball- Improve your inner core strength and stability by joining this challenging class. Great fun!Suitable for all abilities. Zumba Fitness – This is exercise in disguise. A mix of many dance styles from Salsa and Merengue to Reggae and many more. It’s energising and fun. Are you ready to join the party?! Suitable for all abilities. Zumba Toning – All of the above but with the added bonus of using toning sticks. Wonderful!!!! Suitable for all abilities. YOOP – Keep that hula-hoop spinning and then deepen your yoga-based stretches with the aid of the hoop. Ideal for toning, flexibility and a fun class for all-round fitness. Suitable for all abilities. Drop in and Bliss Out – A guided meditation and relaxation class. Suitable for all levels. Ideal to still the mind and body, relieve stress and completely let go. Children over 14yrs are welcome to all classes if accompanied by an adult. We are currently offering Yoga for Dancers workshops aimed specifically at those dedicated dancers out there. If you want to strengthen, tone, breathe, sweat and enhance your dancing then this could be the workshop for you. If you are a dance teacher then please contact Centre to find out more about these workshops and how yoga can enhance any form of dancing. They are delivered by a qualified yoga teacher and BATD dance teacher who has danced professionally around the world. They can also be delivered at a venue of your choice. Develop, Deepen, Dance……. Our prices for regular classes are £4.50 (£4 for under 16 and over 60′s) and Astanga Yoga is £5.50. 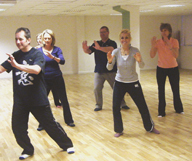 Workshops and specialist classes are individually priced. Corporate and private classes are also available (prices on request). Please call +44 (0)1429 275794 for further information on classes and workshops and to book places.